When I first saw McCall’s 6697, I knew I had to make it in black and white. It’s a striking design and would be perfect as a summer maxi for both my climate and my lifestyle. I love the way the stripes swirl around the body, and the fit — moderately close above the waist, full and fluid below the waist — would be cool and comfy. I picked up some white and black jersey with a bit of lycra, and as it prewashed, I studied the pattern to try to figure out how to shorten this thing. I’m only 5’3″, and I have to shorten all my patterns. It’s second nature by now. But this pattern stumped me just a little. The pieces are cut in such a way that it was difficult for me to visualize the placement of the waistline, for example. This is not the pattern’s fault, but mine. I just couldn’t see how the pieces would lay on the body sufficiently well. So I made a paper copy of all pattern pieces on sturdy tracing paper and pinned the pieces together along the seam lines. I like doing paper fittings like this from time to time because it’s a quick and dirty way to check fit before cutting the fabric. 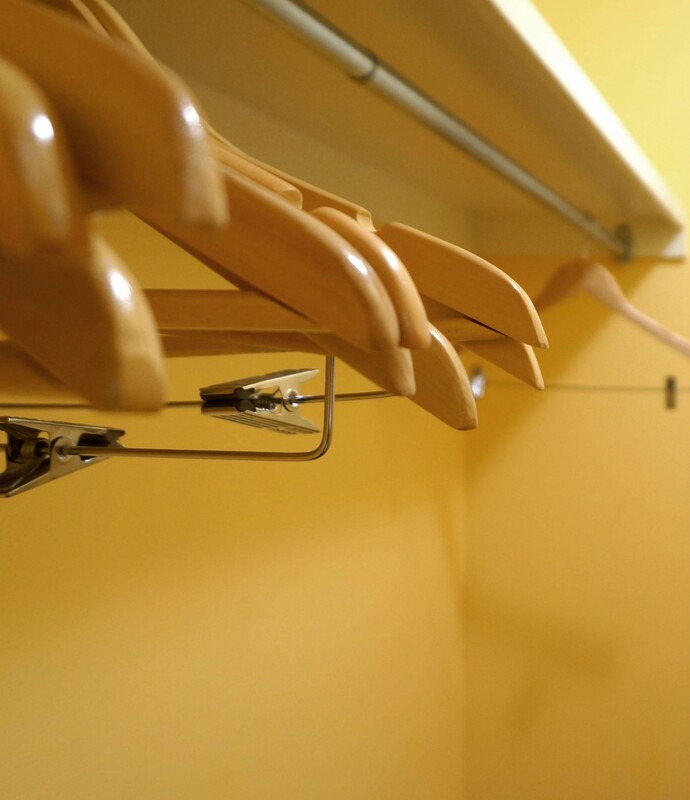 It’s not perfect and I don’t recommend it for close-fitting garments or things that require precise fitting, but it works well enough for general fitting checks. In this case, I discovered right away that I would need to lose about 5 inches of length below the waist. Above the waist seemed more or less okay. Here’s what the pattern looks like when laid on the black jersey. 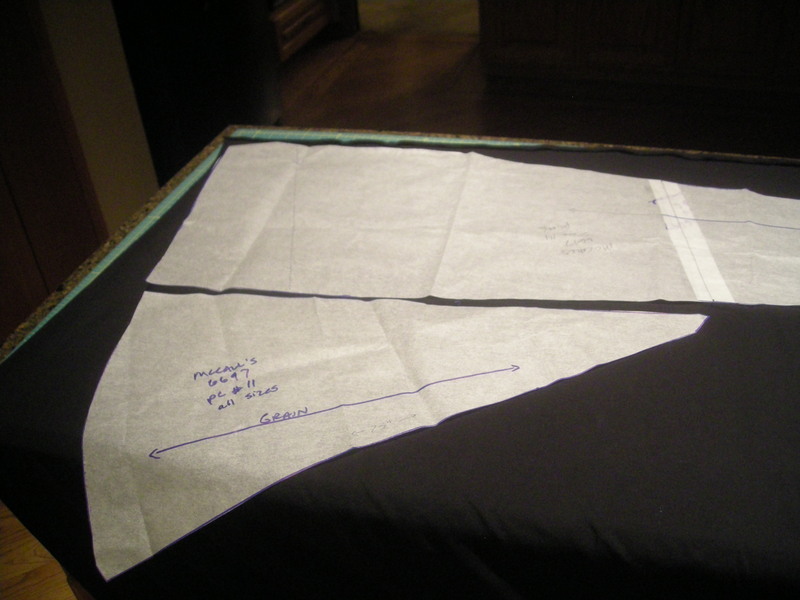 The triangular piece is the gore, and I laid it beside one of the pattern pieces just for a visual reference. You can clearly see the blue grainline marking on that piece and see that it’s not laid on the grain! But it is laid next to the pattern piece where it would be seamed, something I did to check that I wasn’t approaching this incorrectly. On the long pattern piece, that bright white stripe to the right is the place where I overlaid the cut halves of the shortened pattern pieces to tape them back together. You can see that the white patch is above the point where the gore seam will end, which was my goal. I wanted to take the length out just above the gores. After I cut apart a pattern piece to shorten it, I used the grainline markings to keep everything straight while retaping. Then I regraded the side seams, which didn’t require much work because most of them only needed minor adjustments of around an eighth of an inch. This turned out to be a pretty handy way to shorten a real puzzle of a pattern — I mean puzzle in the sense that the pieces all have to fit together just so, not puzzle in the sense that it’s confusing. If any of you were thinking about making this one but were unsure how to go about shortening it, maybe this will help you. How can anyone not like polka dots? They’re cheerful, casual, and bubbly. Some prints are distracting, but polka dots tend to scan a little softer on the eyes. 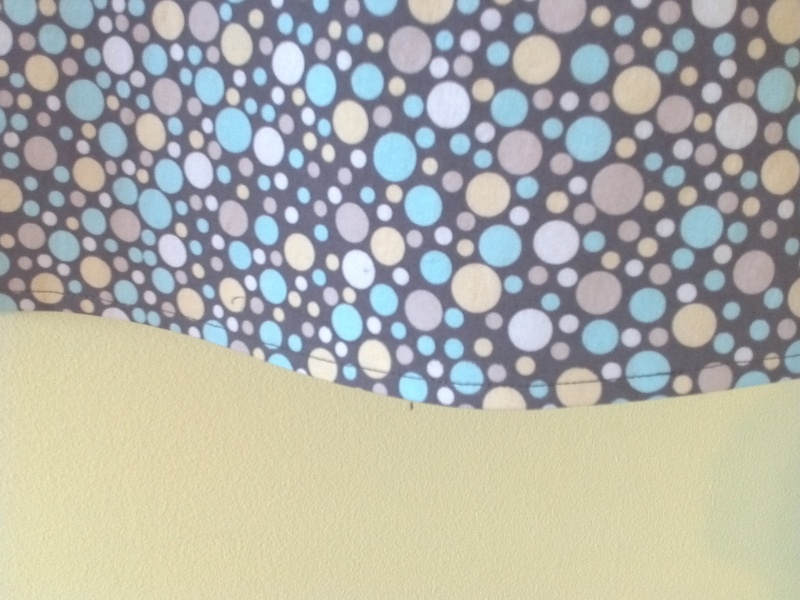 So when I saw this lightweight cotton in my perennial favorite, gray, covered in all these pretty polka dots, I had to have a bit of yardage for a skirt. This one was on clearance at QuiltFabric.com locally, and I do like a light summer skirt made in a fun quilt print. 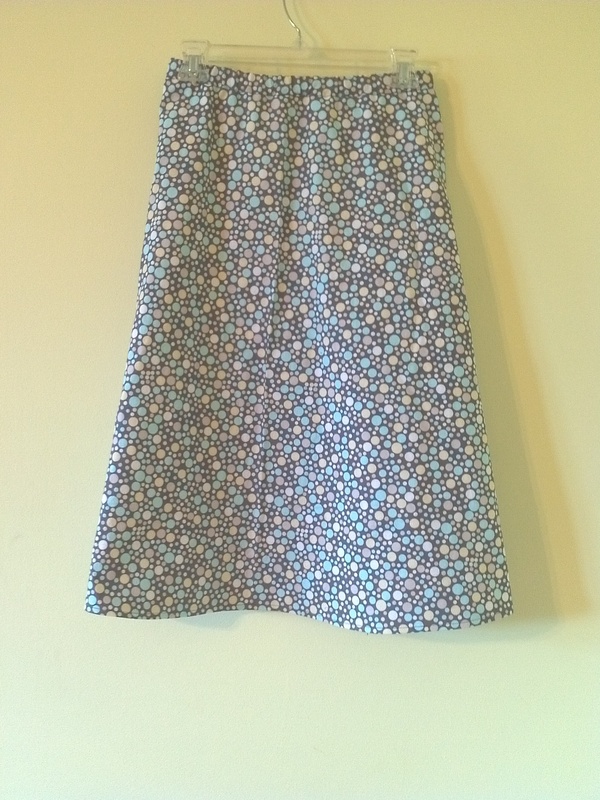 I used Simplicity 1807, view C, but I omitted the drawstring for the waistband and the flounce for the hem. This is a great pattern that yields fast, easy, reliable results, the kind of pattern you can use over and over again. 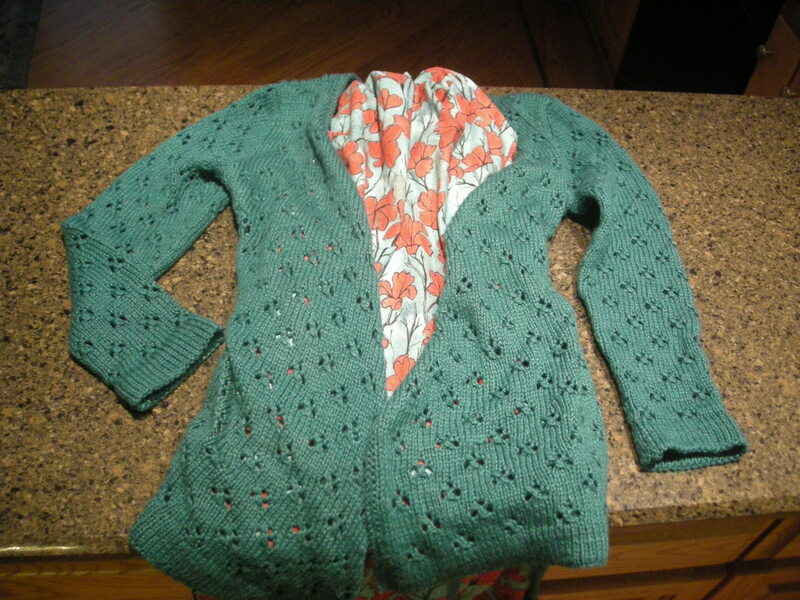 I’m nearly finished with another variation on this same pattern and will post that one in a few days. 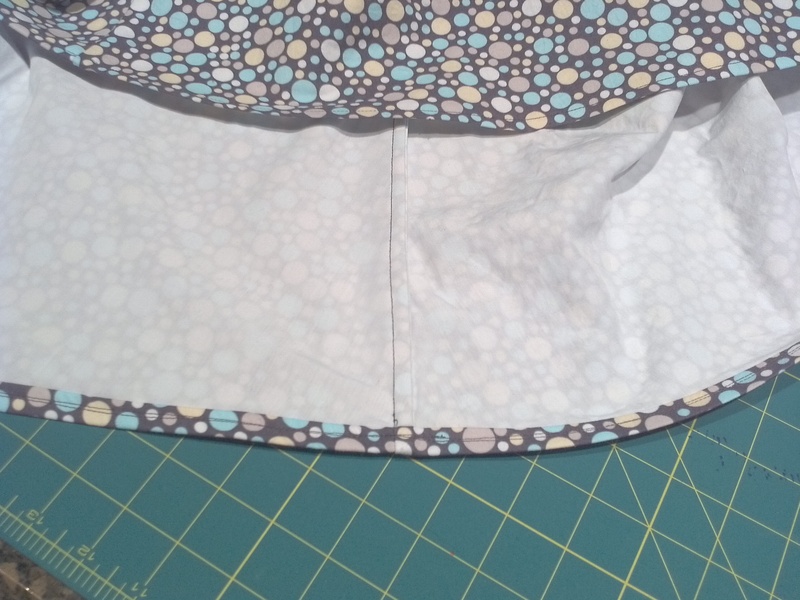 Because this fabric was lightweight and might have lacked a little body, I decided to interline it. I used to always use bleached muslin for interlinings, but when I prewashed the last two lengths in my stash, neither help up well. I don’t know what’s going on in the world of muslin lately, but these were both of very poor quality. Anyone know where to find good muslin that’s sturdier than tissue in the washer? So I ended up using a length of white cotton shirting from Fishman’s for the interlining. 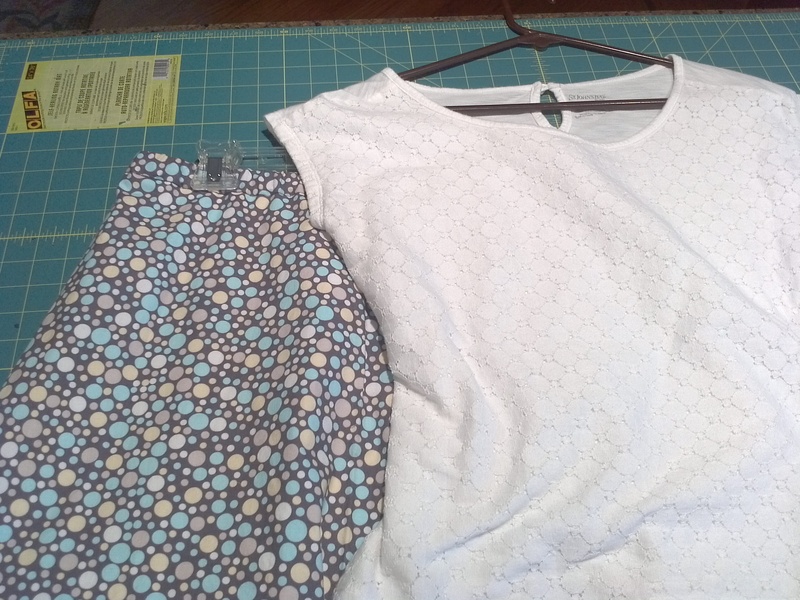 My original plan for this shirting was to make a nightgown, but after deducting some for the skirt interlining, it will now be used to make a shirt. Using a shirting fabric to make a shirt? I guess sometimes I do play by the rules, after all. I used a water soluble spray glue to adhere the layers together, and then French seamed the side seams. I’m a sucker for a French seam. I just love them and use them wherever possible. In this case, because the French seams plus the double layer of fabric added some complication to the hem area, and because this is a super casual skirt in the first place, I decided to use a sewn hem. I toyed with the idea of doing a blind him, but by this point, the spray basting was losing its grip and the layers were beginning to slide around on each other. And I’m just not all that into a machine blind hem, anyway, and the thought of trying to hand hem those sliding layers — yeah. A sewn hem is just fine. It’s casual, but it works. See? Here’s a close-up of the sewn hem, basically just machine rolled with both layers together. I used elastic in the waistband, but no drawstring, only because I ran out of fabric and couldn’t cut the pieces for the string. I looked for ribbon at several shops, including Soutache, a store that really sparks my creativity. She carries amazing buttons and ribbons, but this time, she didn’t have a simple grosgrain in the color I wanted. So, no drawstring, which is just fine. This is a skirt to be worn with simple tees and tanks, except I did stumble on this ivory lace tee at an area thrift store that repeats the circle motif. Love it! So I have a feeling I will almost always wear this lace tee with this skirt, because it’s just too perfect. I like looking pulled together even when I’ve being casual, and this just works. 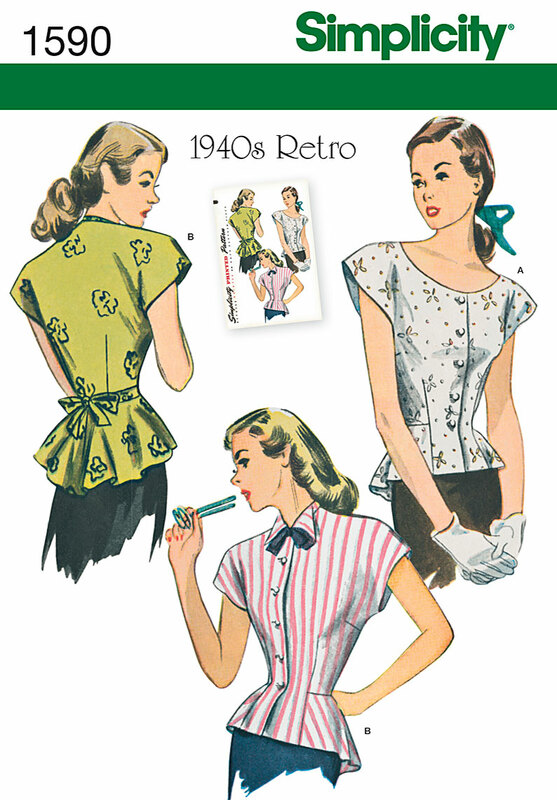 My review on Sewing Pattern Reviews is here.